With all the press and excitement in the past few weeks over $3000 full-frame Digital SLR cameras, it is easy to forget that many buyers are looking for the absolute best "bang-for-the-buck" in a camera. There is little doubt that you will find that best value today in interchangeable lens DSLRs that now offer almost all of today's checklist features starting at a $499 street price. So what do you get for your $500 these days? To answer that question we took a closer look at Sony's lowest-priced DSLR. 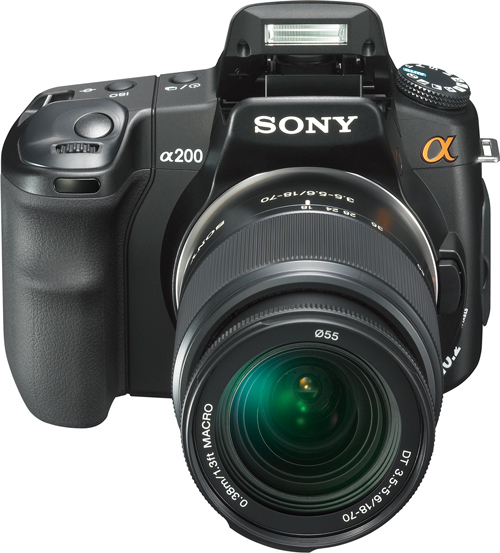 The Sony A200 sells complete with a Sony 18-70mm (27 to 105mm equivalent) lens for just $499 - sometimes even less. 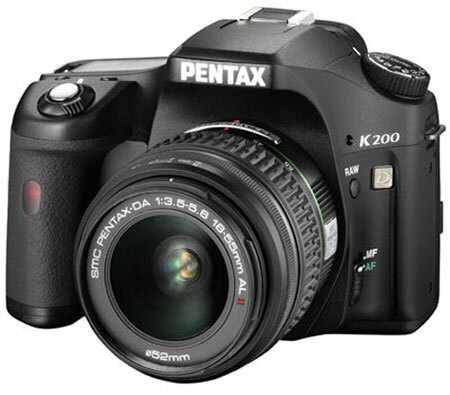 The A200 also features body-integral image stabilization, which means the IS will work with any lens you mount. Sony does not include Live View in the A200, choosing instead to feature Live View only on the A300/A350, which use a uniquely easy to use and useful Live View compared to competing models. The only competition in the $500 arena is the Olympus E420 which sells for around $530 with the 14-42mm (28-84mm equivalent), and the recently reduced Canon XS with a current street price of around $525 with an Optical IS 18-55mm lens. The E420 is the smallest mirror DSLR on the market. However, it is now the only camera in its class to not offer some form of IS - either in the camera body or by including a kit lens with IS or VR built-in. You will have to move up to the E520 at $100 more for IS in the body. 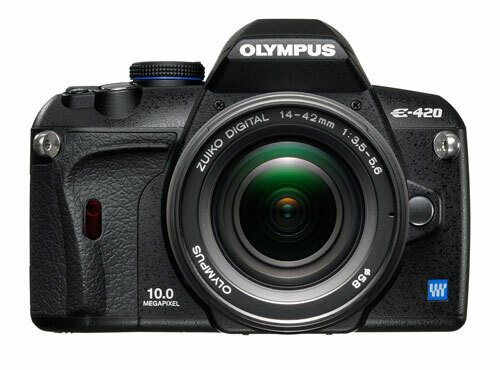 The E420 does feature Live View, a feature pioneered by Olympus, including both phase-detect and contrast-detect options. The Canon XS also includes both Live View options. 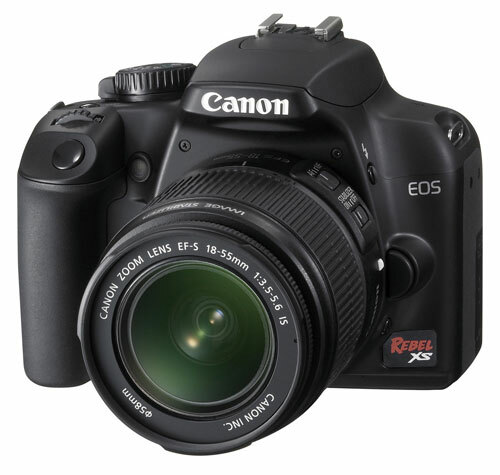 The DSLR "entry" market also includes the next rung at a $599 street price with lens. 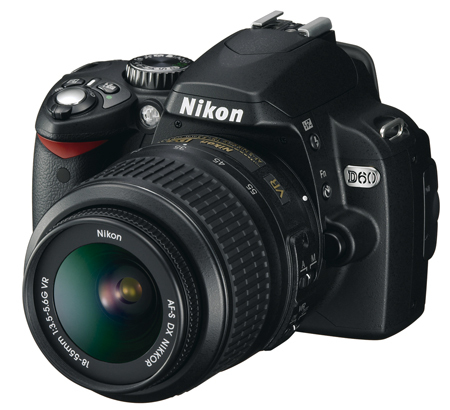 This adds the Nikon D60, Olympus E520, Pentax K200D, and Sony A300. All five sell for a street price of $599 with an 18-55mm or equivalent kit lens (18-70mm for the A300). The Pentax, Olympus, and Sony feature body-integral IS that works with any lens and the Canon and Nikon kits include a stabilized kit lens, but still require IS or VR lenses for the IS feature. Clearly this has become a very crowded market segment, which is great news for buyers. In the $499 to $599 price range you now have a choice of no less than seven models from the top five DSLR manufacturers. With such a wide selection there are a lot of models competing for your attention and that can lead to even better prices. Today we will take a closer look at the Sony A200, which is arguably the lowest priced "full-featured" DSLR you can buy today. Does this price-leader also bring true value to the DSLR market? It's hard to decide which camera to go for the coveted Entry Level DSLR position. Plenty of friends consider Canon or Nikon as the major players, and own either one. Having the opportunity to pick up the A200K for $413 shipped/no tax from SonyRewards last June helped factor in that decision. As a person who had zero experience or knowledge of the SLR domain, this was quite a gamble. So for the past 4 months, haven taken over 8000 pictures (in RAW), and been to 2 foreign countries, this was definitely worth the investment. The biggest thing Sony has going for them is the backwards compatibility of the Minolta AF lens line. I picked up a 50mm f/1.7 + 70-210mm f/4 (the "beercan") off CraigsList, since these seem to be "the" lenses to get. Having researched throughout these past few months about aperture, ISO, crop factor, etc... I'll probably pick up a 28mm f/2.8 also. All in all, the Sony A200K offers a lot: 18-70mm kit lens - bigger than the rest, Minolta AF (Maxxum) Lens backwards compatibility, and plenty of alpha-based accessories. This one seems like a winner. Hmm. I'm more critical of the ISO performance of the Sony A200. It just doesn't seem that good above 800. The Nikon and Olympus are decent and the Canon is affected by some softness and chromatic aberrations at all ISO settings, something that I attribute to it's junk lens. Given a better lens it would probably show it's stuff, but this is a budget comparison and that would be unfair. I wish Canon would spend even $3 more on making their cheapo 18-55. The Canon lens used for testing was their excellent 50mm f1.4, so you can't blame the results on a cheapo lens. All of the tests used 50mm f1.4 primes execpt the Olympus where a 35mm macro was used because of the 2x lens factor. ALL these lenses are in the best part of their resolution curves at f/4, which was a requirement. I think you are using a few features in the A200 that are not even used by the buyers in this price range. wireless flash ... I mean come on ... what is the lowest priced Sony external flash that will work with this ? I found the HVL-F42AM as the lowest level model for about 1/2 the price of the A200 kit. No entry level DSRL user will shell out that much money for external flash, they will buy a better body in the first place.